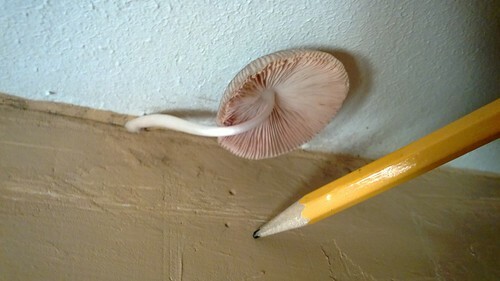 On the Bathroom Ceiling – Mushroom – Let's Paint Nature! I am not making this up, folks! 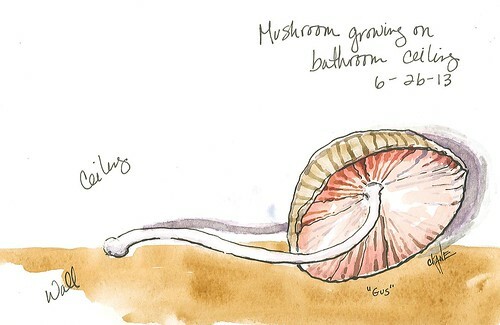 How ironic I was just posting what grows on the forest floor (not done with that btw), when what do you know? Nature comes to me. 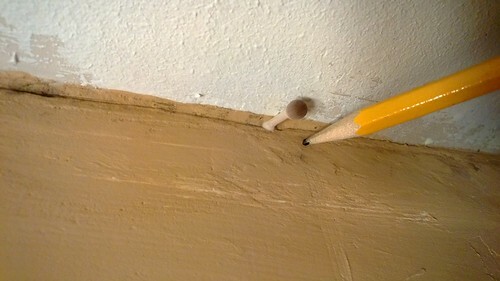 Now, I know it’s not healthy to have mushrooms growing in your home…all those spores I’m breathing in…and I notified the landlord, but I am kind of fond of the little fellow! He surprised me when I discovered him, I watched him grow, measured his progress, and permanently put him in my sketchbook. Can’t help it, too late, I like him! I have a large brown spider in my bathroom. “Spidey” fell off his perch between the wall and the ceiling. Maybe he’s dangerous; maybe not but I love him. Isn’t it strange, the things that claim our heart? Long live Spidey. Lol. OMG…how funny. I had one growing on my deck, but yours is the “topper”. That is too funny! 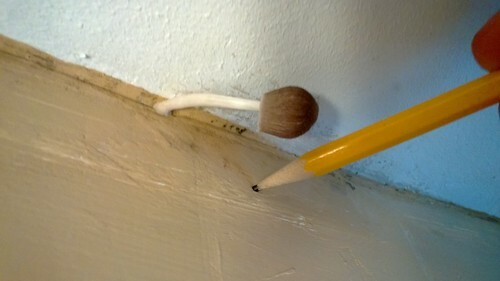 I’ve never heard of a mushroom growing indoors. Glad it has “grown” on you and is preserved for life in your journal. I never heard of it either until I googled it and saw pictures of mushrooms growing on carpets and everything! Wow! They’re clever little guys huh?